Despite Velasquez attempting to turn the tide of the match, Fortuna was simply too elusive throughout the contest. The end came at 35 seconds into the tenth round, as referee Russell Mora waved off the action as Fortuna was beginning to hammer Velasquez around the ring. The 26-year old champion is riding a great high and spoke of his performance afterwards. Fortuna claims to have injured his left hand shortly after registering his only knockdown in the match. Stay tuned for more post-fight updates from Las Vegas. 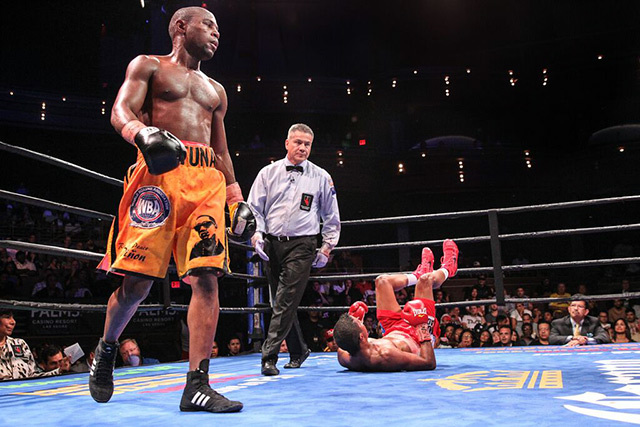 LAS VEGAS – Javier Fortuna dispatched of Carlos Velasquez in impressive fashion with a 10th round TKO to remain unbeaten in the main event of PBC’s “Toe-To-Toe Tuesday” on Fox Sports 1 that emanated from The Pearl inside of The Palms Resort. Velasquez (19-2) was never much of a threat to Fortuna (29-0-1, 21 knockouts) from the outset as he was continuously beaten to the punch as the awkward Dominican strafed his foe from all angles. In the second round a Fortuna straight right hand connected above the ear and dropped Velasquez. Fortuna went for the finish but Velasquez was resolute and made it out of the round with a seemingly broken nose. Even though Fortuna could have likely gotten rid of Velasquez at any time, he was comfortable shifting to cruise control and landing pot shots over the course of the next several rounds. Velasquez tried to punch his way back into the bout but was simply unable to find his target. Perhaps aware of the fans restlessness, Fortuna put his foot on the gas in the tenth frame and throttled Velasquez with a variety of power punches to the head and body that finally forced referee Russell Mora to call a halt to the fight at the 45 second mark. In a battle of unbeaten prospects, Dominque Dolton (17-0-1) and Oscar Molina (13-0-1) kept their respective unblemished records intact with a majority draw after ten rounds of entertaining action. In the early going it was Dolton’s activity that offset Molina’s potshot efforts. However, things took a turn for the dramatic when Molina caught Dolton early in the third round with a left hook that badly wobbled the Detroit fighter. But Dolton maintained his composure and refused to be taken out despite also being marred with a badly damaged right eye. Dolton regained control in the middle rounds with crisp combinations and ring generalship, as Molina couldn’t land more than one meaningful punch at a time. Molina found a second wind in the 7th and began tearing away at Dolton’s body. But Dolton wouldn’t buckle under the pressure and engaged in some exchanges that brought the crowd to their feet. Both closed impressively and the draw was well deserved as one judge saw it in favor of Dolton with a 97-93 score while the other two judges had it even with scores of 95-95. Mayweather Promotions’ Andrew Tabiti scored a resounding TKO stoppage against Tamas Lodi in cruiserweight action. The hard-hitting Tabiti annihilated Lodi with a straight right hand that dropped Lodi like a sack of potatoes in the second. But more impressive than the punch was the fact that Lodi somehow managed to crawl out from underneath the bottom rope, get to his feet and survive the last ten seconds of the round. However, there would be no reason to send the badly damaged Lodi out for another round as his corner called the bout off before the third round started. Tabiti improves to 12-0 with his 11th knockout while Lodi falls to 16-6-2. Junior lightweight titleholder Javier Fortuna outclassed Carlos Velasquez en route to a one-sided 10th-round knockout victory to retain his belt on Tuesday night at The Palms Casino Resort in Las Vegas. Fortuna showed no mercy as he pounded Velasquez with punches from all angles throughout the Premier Boxing Champions card's main event. He knocked Velasquez down with a counter right hand behind the ear in the second round, bloodied his nose in the third round and appeared to take glee as he continually talked to Velasquez's corner as he administered punishment. "I went ahead and looked back at his corner as I was hurting him because I wanted them to understand that I could go the full 12 rounds and that I wouldn't stop until the final bell rings," Fortuna said through a translator. Fortuna, a southpaw whose fast hands unleashed combinations at a torrid pace, did not need to fight until the final bell because he got the knockout. With recently retired pound-for-pound king Floyd Mayweather at ringside -- his Mayweather Promotions put on the card -- Fortuna was all over a fading Velasquez in the 10th round, hammering him with numerous unanswered blows. When he connected with a straight left hand that bounced Velasquez into the ropes, referee Russell Mora intervened and stopped the bout 35 seconds into the round. Fortuna (29-0-1, 21 KOs), 26, who is from the Dominican Republic and trains in Boston, immediately launched himself into a somersault across the ring to celebrate his victory in the first defense of his secondary 130-pound world title; the main belt is held by Takashi Uchiyama of Japan. Fortuna won the vacant belt via unanimous decision against Costa Rica's Bryan Vasquez on May 29 at the Barclays Center in Brooklyn, New York, on the Amir Khan-Chris Algieri undercard. Fortuna's dominance against Velasquez was reflected in the CompuBox punch statistics. He landed 168 of 453 punches (37 percent) while Velasquez landed only 51 of 287 blows (18 percent). Velasquez (19-2, 12 KOs), 31, a 2004 Puerto Rican Olympian, who did not turn professional until 2007, saw a four-fight winning streak come to an end as he suffered his second 10th-round knockout loss. In the junior middleweight co-feature, Oscar Molina (13-0-1, 10 KOs), 25, of Norwalk, California, and fellow prospect Domonique Dolton (17-0-1, 9 KOs), 25, of Detroit, fought to a majority draw. One judge had Dolton winning the fight 97-93 but was overruled by the two other judges, who both scored it 95-95. Molina, a 2012 Mexican Olympian, had defeated Dolton in a 2007 amateur bout.